In 2018 the Nautica Malibu Triathlon raised over $1.4 million for Children’s Hospital Los Angeles. This is the most the event has ever raised! 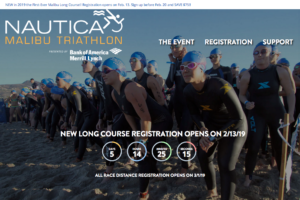 To date, the Nautica Malibu Triathlon has raised nearly $14 million to date for pediatric cancer research at Children’s Hospital Los Angeles. The Nautica Malibu Triathlon and CHLA have enjoyed an amazing 10 years of partnership and look forward to continue working with and raising important funds for CHLA.